Failed comedienne Kathy Griffin just can’t seem to keep her nose out of the political arena, despite the damage being outspoken on such topics as done to her career. 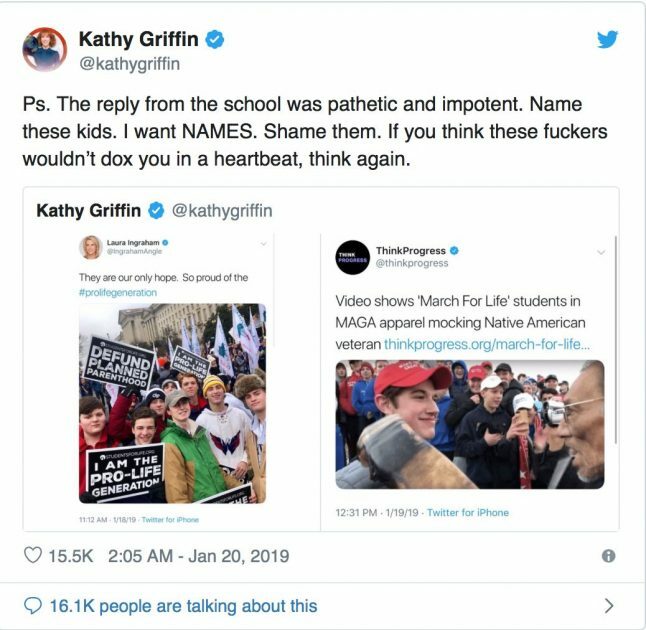 This time she’s setting her sights on the kids from Covington Catholic High School who were the talk of the town this weekend after a video surfaced of the students allegedly taunting a Native American activist. That ended up being a false narrative as later video showed, but that hasn’t stopped Hollywood dolts like Griffin from brutally going after the kids. According to the suit, Griffin and Bick “undertook a campaign of secret electronic surveillance and recording almost immediately after taking up residence,” first with their iPhones, then with an audio-video surveillance system that was pointed directly into the Mezgers’ backyard “in order to spy on and record them.” The suit says that Griffin and Bick “illegally captured hundreds of hours of audio and video from the Mezgers’ back yard” and that the Mezgers only learned about it in September 2017, months after the secret recordings began, when Griffin and Bick leaked one of the recordings to the media. She’s a foul-mouthed, mentally unstable failing celebrity who is desperate for a little relevance to help boost her sagging career, but unfortunately for her, the vast majority of people in this country could care less about her. These kids are scapegoats for a left-wing movement that wants to bury all of the positive work accomplished at the March for Life by doing what they do best and screaming “racist!” at the top of their lungs like a bunch of children. Time to grow up kids. Unfortunately for them, facts don’t care about your feelings, and the facts here prove these kids are innocent.